This British Standard slip test method will help you reduce slip accidents and prevent slip injuries. SlipAlert can save you money. This slip test equipment gives you a fast and easy way to monitor and manage slip risk in your business. Hire SlipAlert for one week. Anyone can quickly and easily test all your floors and identify potential for safer floors. Test all your floors before and after changes. These have been formulated to give similar results to Four S rubber, but with greater endurance. Four S rubber as used on the TRL Pendulum. For details of sliders, please contact Jenny. SlipAlert can save your business money on new flooring, on floor maintenance, on cleaning, on slip prevention and using SlipAlert will help you to reduce slip accidents and the costs associated with slip injuries. Slip testing conducted in accordance with BS8204 and SlipAlert LLP recommendations. If you live anywhere else in the world please contact us by email or telephone for a price. 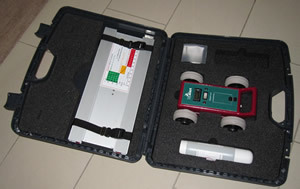 The SlipAlert test machine in its wheely case. 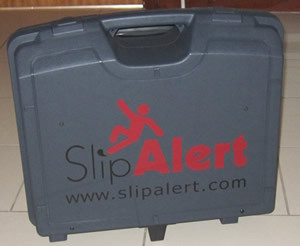 SlipAlert is now it is even more portable with a custom made “wheely” case. Customers who have used it are finding it even easier to take SlipAlert out and about to test floors. Free with every new SlipAlert. Underneath SlipAlert. The slider pad is crucial to the measurement of slip risk. For more infomation about different sliders and slider care please call Jenny.